When I’m not reading or writing about comics, I masquerade during the day as a High School English teacher. I like to think that I am pretty good at it, too, as I am constantly looking for new and inventive ways to engage my students in the pursuit of high order critical thinking, as well as help them develop the tools they need to lucidly express the products of those thoughts. I often use comics (oh, excuse me, “graphic novels”), in my teaching as a unique medium in which to do both. I firmly believe that comics have a place in the Language Arts curriculum and I am always excited to discover new ways in which I can integrate them into what I am doing. So when our avuncular Comics Bulletin publisher, Jason Sacks, asked me if I would like to review an independent documentary called Comic Book Literacy for the site, I jumped at the chance. Unfortunately, what I jumped into ended up sticking to the bottom of my shoes, leaving foul smelling tracks all over the new carpet. The problem is, though, that this film really doesn’t do that. A matter of fact, let me cut right to the chase. This is a rambling, unfocused, amateurish documentary that may actually do more harm to the cause of integrating comics into the curriculum than it does to promote it. The film starts off seemingly on the right foot by featuring interviews with an impressive list of comics’ luminaries the likes of Art Spiegelman, Joe Quesada, Marc Andreyko, Paul Dini, Terry Moore, Scott McCloud, Jim Salicrup, and Gail Simone who talk about how they got hooked on comics and how it inspired them to become readers. From here, the film seems to lose focus as it stumbles through a historical retrospective of the evolution of comics (with a particular focus on the creation of the Comics Code Authority), bounces off the relationship between librarians and comics, trips into a discussion of the relationship between the military and comics (with an inordinate amount of time given to the Heroes4Heroes foundation), staggers into a piece about something from 1926 called Texas History “Movies”, and finally falls flat on its face discussing Free Comic Book Day. What any of the final 3/4 of this film has to do with comic book literacy is a mystery to me. 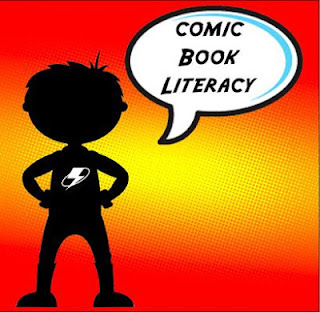 Nothing about it had anything to do with how comics can be used to foster literacy, engage students, point to human truths like other literature, or help develop an elevated vocabulary. In the absence of adherence to its original intent, the film becomes lost and jumbled and just plain bad. I like to think of myself as above pettiness, but seriously, if I had to hear the little glockenspiel and oboe sonata that Todd Kent kept using as a bridge between shots, I was going to scream. Teachers can use comics in their classrooms with fabulous results. At the beginning of the film, Art Spiegelman does a great job of explaining how comics can be an excellent tool for promoting early literacy and as an adjunct to develop decoding skills. Had the focus of this film been more on that, if Todd Kent had thought to interview teachers who use comics, or film students using comics, perhaps this film would have been a better documentary. But he didn’t, and I cannot figure out why. My only guess is that Mr. Kent got too caught up in his own interests to actually pursue a film about the educational possibilities of comics. This was a missed opportunity at best. As comics are increasingly gaining mainstream acceptance, and their use in classrooms is growing in popularity, a film like this only serves to remind people why it has taken so long for that to happen. While I applaud Todd Kent for his desire to make this film and for his decision to stay out of the way and let his subjects do the storytelling, I just wish he had made a better film.